Forget Sherwood Forest, fat friars, tight-fitting green jerkins and Errol Flynn's bulging emerald tights. You'll get none of that in this Robin Hood, which could, in fairness, claim to be trying something new with a story that's been told a thousand times. 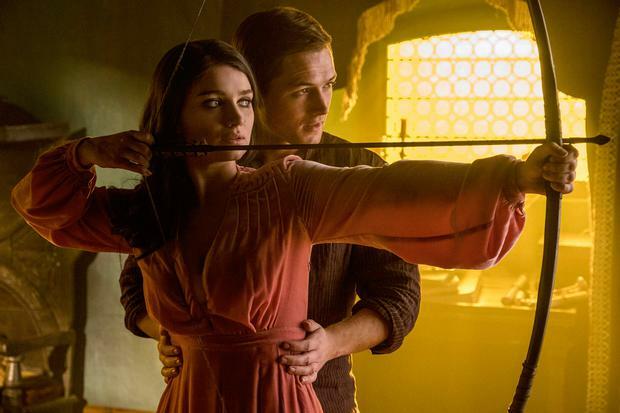 I got bored trying to count how many movies and TV shows have been inspired by the English fairytale, and this Lionsgate production is the first of three Robin Hood films we can expect to see in the coming years. Lucky us. It's directed by Otto Bathurst, whose background is in advertising and television: his recent credits include Peaky Blinders, and there's a touch of that show's urgency and flashy pugilism on display here. In a breezy voiceover that sounds like it was delivered by a denizen of 21st century Essex, we are situated in time (the Third Crusade is about to kick off, which would make this the late 12th century) and place (deepest Nottingham) where the rosy-cheeked nobleman Robin of Loxley (Taron Egerton) has just fallen in love. The object of his affections is Marian (Eve Hewson), a handsome young woman with big blue eyes and a strident social conscience. Robin is not indifferent to the rotten lot of the medieval underclass either and, in short, they seem like love's young dream until he receives an official scroll informing him he's been drafted to fight for the one true God. Cut to the Holy Land, where the Crusades are shot to resemble the recent conflicts in Afghanistan, or Iraq. Dusty English troops dive for cover in ruined cities as Saracens snipe with evil-looking contraptions that might be distant ancestors of the Gatling gun. Arrows fly, soldiers fall, boulders crash in from distant Christian artillery. War, we are soberly reminded, is hell, and all of this is a perfectly acceptable conceit, so far as it goes. Robin is dodging his way through all this carnage when he witnesses what we would now call a war crime. So far as I recall, absolutely anything went in the Crusades, but Robin would not appear to have got this memo and attempts to intercede when his commanding officer Gisborne (Paul Anderson) tries to get a prisoner to talk by killing his son. Yahya, or John (Jamie Foxx), will remember this kindness and follows Loxley back to England at the end of the campaign. There Robin finds that local grandee, the Sheriff of Nottingham (Ben Mendelsohn, at his most flamboyantly villainous), has seized on his absence to board up his family seat. Worse still, Marian, assuming Robin was dead, has moved on and is now dating Will Tillman (Jamie Dornan), a dashing and impassioned campaigner for the poor. Robin has retreated to his ruined castle to sulk when his Saracen friend John appears, and tells him to get his act together. The poor of Nottingham are being fleeced by the Sheriff and his clerical allies and John reckons he and Robin ought to start stealing it back. The makers of this film are either deeply fuzzy on their 12th century social history or have decided to set their adventure in a kind of imaginary middle England, so let's give them the benefit of the doubt. Their Nottingham is like one of those 19th century dark satanic mills, and the costumes look suspiciously machine-stitched and fashion-forward: Mendelsohn's fascistic frock coat would not look out of place on a catwalk. There's nothing wrong with re-imagining these cherished tales, but you can't be half-hearted about it, and Robin Hood's set and costume designs are as half-thought out as the film's storyline. Foxx radiates a surly charisma as John, but is underused and looks confused. F Murray Abraham, a person who can act, turns up as an evil Cardinal, but probably smelt a rat the moment he walked on set, so contents himself with smiling knowingly, like Salieri or that dreadful Dar Adal from Homeland, and departs with quiet apologies, his dignity intact. In fact, the film is coming down with good actors, and right beside the baby-faced and deadly dull Egerton stands a thespian (Jamie Dornan), who would have made a much better Robin. But it's hard to blame actors for a film so lazily and sloppily assembled. I believe the correct term for this kind of heightened industrial approach to classic tales is Steampunk. Whatever it's called, I do wish they wouldn't.